Thomas Quigley was a beloved husband, dad, and grandpa. 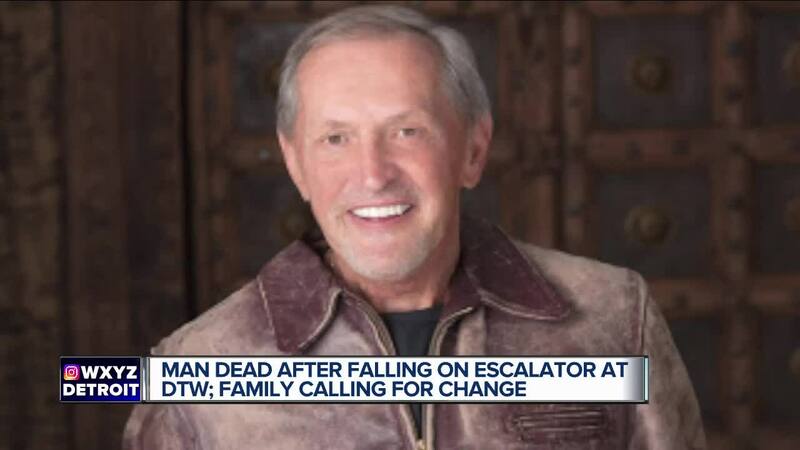 When the 71-year-old picked up his mother-in-law at Detroit-Metro Airport in September of last year, his family says he acted like a gentleman and offered to carry her luggage. Both hands were full. When the luggage got stuck on the escalator, he lost his balance, then fell to his death. METRO AIRPORT (WXYZ) — Thomas Quigley was a beloved husband, dad, and grandpa. When the 71-year-old picked up his mother-in-law at Detroit-Metro Airport in September of last year, his family says he acted like a gentleman and offered to carry her luggage. Both hands were full. When the luggage got stuck on the escalator, he lost his balance, then fell to his death. “They are thinking of the greater good here,” said Shereef Akeel, an attorney representing the family. Akeel says he represents the family even though right now they are not suing. They are simply asking for change. The family says when you get your luggage at Detroit-Metro, right away you see an escalator. It features a sign telling you to hold on, but there are no signs on the escalator telling you where the elevator is if your hands are full because of luggage. Akeel says at some airports there are signs right at the escalator making sure travelers know it is recommended they use an elevator if their hands are full. “You see what other airports are doing, taking that proactive stance, especially for the elderly and the disabled. They are giving them a choice,” said Akeel. The Wayne County Airport Authority says over the past five years less than fifty people have been hurt on escalators at the airport. Only Mr. Quigley lost his life. It says its signs comply with state laws, and, “While we may modify our signs in the future, we don’t have plans to add language prohibiting luggage. In our baggage claim areas, customers have the option to use elevators or escalators.